Former Secretary-General of the United Nations, Mr. Kofi Annan, has said that the huge wealth generated from Nigeria's oil and gas wells has not lifted the country's poorest people from abject poverty. Annan, who spoke on, “New Ideas for Fighting Poverty” in Abuja on Wednesday, at the Festival of Ideas organised by ThisDay Newspapers, also asked older politicians in Africa to give way for younger leaders to emerge like President-elect, Barack Obama of the United States of America. The former UN Secretary-General said Africa was privileged to be blessed with abundant natural resources but regretted that the resources had not always been used for the benefit of the people of the continent, especially the poor. He asserted that that Nigeria's huge oil revenues had not translated into benefits for the poorest people in contrast to some countries like Botswana that had managed their natural resources well. 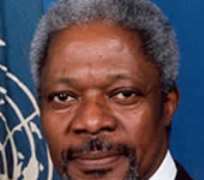 Annan added that when his native country, Ghana, discovered oil, it had to consult with Norway, because of its reputation in managing its oil resources effectively and efficiently, thereby establishing itself as a global role model. Following the example of Norway, according to him, Ghana has set for itself the goal of establishing savings from oil to tackle the challenges of poverty and weak infrastructure. He said companies operating in Nigeria and on the continent in general needed to realise that a stable environment was essential for business. He urged both the pubic and private sectors to collaborate in the fight against poverty. Annan said, “The challenge of fighting or reducing poverty is a great one for all of us in the continent. Over 70 per cent of Nigeria 's 140 million live under $1 a day and this is also true of every part of the continent. We do not only have a moral obligation but also self interest to address poverty. “Any society that is ridden with poverty could be unstable. A world where there is gross inequality of wealth and opportunity is not an environment that will enjoy stability and peace in the longer term. “The story of poverty is a bit more complex. In the last quarter century, half a billion escaped poverty, but most of them are in Asia . In Africa , some countries have made progress. He added, “Nigerians need opportunities to fulfill their potentials. We need to put in place regulatory systems. The experience of African nations in fighting should include creating access for the poor. “We should be able to create a system that will allow them access to get loans from the banks and with a bit of management and advice from the banks, the poor will surprise us. The world statesman said fighting poverty in Africa cannot be successful without integrating farmers. He regretted that African farmers are the only ones in the world that are left to sink or swim alone. If the farmers are going to increase their yields, he added, they need to be helped with the right seeds, fertilizers, access to credit, irrigation facilities as well as marketing support. He also spoke on the need for insurance companies to come up with schemes tailored to the need of farmers. He said Africa can improve on trade within the region by $250bn if adequate investments are made in energy infrastructure. He also said that empowering women and encouraging girl education would go a long way in fighting poverty in the continent. On corruption, Annan said the evil has not been perpetrated in the continent by indigenes alone but with active collaboration of foreigners. However, he charged governments in the continent to show seriousness (like Germany ) in tackling corporate corruption. Speaking on the implication of Obama's election, Annan said the age of the president-elect was instructive. According to him, many African societies would not consider a 47-year old man mature for leadership position. “We should do away with the idea of 80-year old men hanging on to power. I make a case for young people. They are intelligent and energetic,” he said. He said the recent presidential elections in Kenya and Ghana show that Africa had moved up in democratic credentials. The election in Kenya , according to him, shows that the continent can no longer accept fraudulent elections. Annan, however, failed to mention the recent elections in Nigeria but commended its vibrant civil society groups and it active press which he said have sometimes been dubbed as overactive. He urged governments in the continent to build their societies on three important pillars – peace and security, development and respect for human rights and the rule of law. Four state governors who were at the forum also spoke on what they were doing and what needs to be done to tackle poverty in their domains and Nigeria in general. For Governor Sule Lamido of Jigawa State , poverty in Nigeria has no basis except the failure of leadership and the system. With abundant human and material resources and sound environmental conditions, there should not be poverty in the land but for the failure of the system and the leadership. Governor Emmanuel Uduaghan of Delta State said poverty in the Niger Delta emanates both from manmade and natural causes. While the people of the region had been marginalised by governments and companies operating in the region, he said his government was working for peace and security, human capital development and infrastructure development. Asserting that the Nigerian political system is becoming more open, Governor Liyel Imoke of Delta State said there was the need to use technology to reduce poverty in the country. The Governor of Anambra State , Mr. Peter Obi, on the other hand, attributed poverty in the country to lack of visionary leadership. He said what the Asian tigers have been celebrating was the result of education. To illustrate that the nation still lacked visionary leadership, Obi said out of one million young people that applied for admission to tertiary institutions last year, only 92000 candidates were offered admission. The governor said nobody has bothered about the rest that were not able to secure admission. Governor of Edo State , Mr. Adams Oshimhole also came to the event which attracted many dignitaries in politics and the media.